OEM replacement Motorcycle Rotor Bolt Kit. Heavy Duty Chromoly Steel Rotor Bolts are built to last. Rotor Bolt Kit Includes all the hardware you need to replace both the front and the rear rotors. Worked good and looks just like OEM, Just as described happy. Keeping the bike reliable and running great is easy with parts at your finger tips!!! Great chain perfect fit fast shipping .Highly recommend. 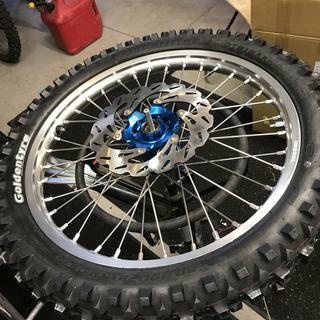 Building a new rear wheel for paddle/sand tire, these worked great to mount my rotor. Just remember to throw on some loctite. Would recommend. Rusty rotor bolts? These tusk rotor bolt kits are the perfect little items to clean up the look of your bike! It’s all about the details, thanks Rocky Mountain and tusk for the best deals! These worked very well when i was installing new brake rotors on my new wheel set. They came with a layer of lock-tite already on the threads which was a bonus so you dont buy any extra ! These are great quality rotor bolts. I highly recommend these and Tusk Products. basically as good as oem. Inexpensive but worth it. Better than the soft OEM bolts. Not much to say. Fit like OEM and seem to be same quality atleast. No problems what so ever. Great price! These work very well. They look like factory original. Perfect fit. Definitely would buy these again. Cant say i have ever bought these before but its convenient that they sell these small kits! everyone has had the bike they bought online with trashy or missing bolts! but these are quick convenient kits at a great value! 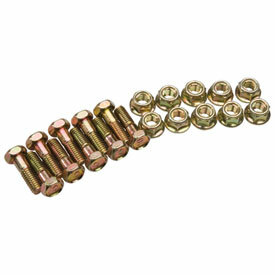 These bolts are perfect replacements for your old dirty/rusty bolts. Add a little dab of Loctite to ensure they never back out on their own. Tusk brake rotor bolt kit. Quality product and a great price point?? getting rid of your old rusty bolts for just a few bucks. Fitment was spot on and they hold great. The finish is durable and they look awesome. I was pleasantly surprised with the quality of this disk rotor bolt kit. Especially at the price I paid at Rocky Mountain ATV/MC! Bolts/nuts look and fit identical to OEM at a fraction of the price. Perfect fit, great quality, zero problems. Got these when I installed some Tusk wave rotors. They work good. The kit has two different types of bolt heads (countersunk and not). Just make sure you match up the right bolt heads. As usual with my Rocky Mountain ATV/MC purchases - good quality and price. Fit exactly like it should, great quality, excellent replacement for old rusted bolts. Great when you have a 2nd set of wheels and don't have spare bolts on hand these are special bolts for the rotors and secure well. Awesome rotor bolt/nut kit for both rotors!! I'm so pleased with this rotor bolt kit made by Tusk. Bolts wear out over time and when your bike starts to age it's a necessity to buy new bolts. This kit from Rocky Mountain makes it super easy for the consumer, the kit comes with enough nuts & bolts to do both the front and rear rotors (on a dirtbike). Twice the bolts for half the price. No brainer. Kit is both front and rear rotor bolts. Works great and at a good price. Worked great! Just as described. Installed as expected. Did not break or strip. Maybe the color is important to you, so I posted it in the title. Otherwise, matches my OEM parts in dimensions perfectly. Better than shelling out for OEM. Very Happy with Support from Rocky M.
First batch of front brake bolts didn't fit my socket very well, customer support made sure that I got a second set, which fit perfectly. Quite happy with the final product and help received. Used on a bunch of bikes without problem. I prefer to use my own lockite so these are perfect. Same as factory, Perfect fit. Come with more than needed. This rotor bolt kit was great. It came with twice as many bolts as were needed, half beveled, half flat to work with any type of rotor. I used them with a new Tusk rotor and the fit and finish of both are top notch. New bolts make things go together easier and these fit perfect and look great.